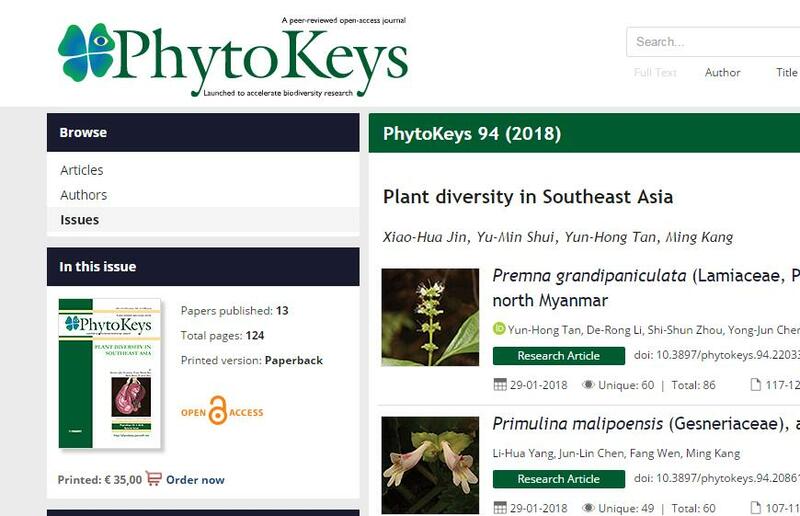 In a special issue of Phytokeys, it highlights a new effort by Southeast Asia Biodiversity Research Institute (SEABRI) to promote awareness of the biodiversity and its conservation in the region. The species richness of biodiversity in Southeast Asia is far underestimated. The special issue is entitled “Plant diversity in Southeast Asia”. It firstly focuses on taxonomic discoveries to bridge the gap between our knowledge and diversity. Twelve articles in the issue mostly involve the description of new species from botanical surveys in the region. They include two new species of Oreocharis (Gesneriaceae) and a new species of Didymocarpus (Gesneriaceae) from Vietnam, a new species of Aristolochia (Aristolochiaceae), a new species of Dendrobium (Orchidaceae), a new species of Gastrodia (Orchidaceae), a new species of Hedychium (Zingiberaceae) and two new species of Trivalvaria (Annonaceae) from Northern Myanmar, a new species of Primulina (Gesneriaceae) from southwest China and seven species of Begonia (Begoniaceae) from Northern Vietnam and Southern China. The description of the little known species, Begonia kingdon-wardii (Begoniaceae) in Myanmar is also included. Results of molecular phylogenetics of tribe Neottieae (Orchidaceae) are also reported. In order to understand and conserve the biodiversity in Southeast Asia, the Southeast Asia Biodiversity Research Institute (SEABRI) was established by the Chinese Academy of Sciences in 2014. It is an international scientific research and education organisation managed by the Xishuangbanna Tropical Botanical Garden (XTBG). With financial and personnel support from Chinese Academy of Sciences, SEABRIseeks to substantially improve our understanding and conservation of biodiversity in Southeast Asia by cooperation with all CASinstitutes, international agencies and government of ASEAN countries.